As we left this place, its that dreaded sense of being taken away, that kicked in AGAIN. The places where we pitch our tents are not our houses, but they give us a sense of home – rest after a long day, protection from the cold night, fire to cook our food, keep the animals out of our beds, keep our most valuable belongings safe, … but above all, they root us to a place that made us dream. We planned for it. We packed for it. We embarked upon a journey to get there. We staked our ground. The land, in turn, gives us incredible returns. She teaches us something new. She shows her beauty. She made us happy. Its always hard to leave. I play the role of a child begging to stay for one more day. He plays the role of the wise one putting some sense into me and bringing me home. This cycle continues. I am in love with you California. Salt flats from the sea that dried up eons ago. You get to run along these canyon walls on this trail. The 5am hike to catch the sunrise. Adults should occasionally get into the sand dunes and play. The sunset from our camp. Light a fire. Cook supper. Read a book. Sleep. We had a rattle snake outside our tent on one of the nights. We lay still, in silence and waited for it to pass. It did. We made many such homes over time and I left a piece of my heart in each place in exchange for a memory. OOTD : Wore the same clothes for 3 days. Everlane Cashmere Sweater. J Brand leggings. One life, one Stetson safari hat per life. Boots. The geologic history of Death Valley is complex: it involves not only fault activity at various times, but also crustal sinking, volcanic activity and erosion. In literal geological terms, Death Valley is a graben; that is, a rift valley formed by the sinking of the bedrock lying between parallel, uplifted, tilt-block mountain ranges. In this case, the two mountain ranges are the Amargosa to the east and the Panamints to the west. Death Valley’s current landscape is the result of slow, massive changes over many centuries. The earliest rocks, dating from the Precambrian Era, are visible today in sections of the Black and Panamint mountains. During the Paleozoic Era (300 to 500 million years ago), seas covered the region, leaving layers of marine sediment and the fossils of many types of marine animals. The present landscape was shaped between 5 million and 35 million years ago, during the Cenozoic Era. After faults formed in the earth’s crust, exceptional folding and volcanic action uplifted the mountain ranges and lowered the valley floor, creating a graben. The present floor is dropping on one side and is actually 8,000 to 10,000 feet above its bedrock base. Intervening space is filled by the massive amount of debris eroded from the surrounding mountains over time. During Ice Ages, Death Valley was periodically filled by large lakes. Their waves carved terraces on the bordering rocks, and their evaporation left alternating layers of mud salt deposits that now cover the basin’s floor. The process of geologic change continues today. The mountains are constantly eroding; their remains spill out into the valley in the enormous alluvial fans which spread like aprons at the mouth of every canyon. Rainfall sends torrents of water down to cut paths through the rocks, subtly altering the schemes of form and color along Artist’s Drive, at Zabriskie Point and within Golden, Mosaic, Grotto, Marble and Titus canyons. Winter storms moving inland from the Pacific Ocean must pass over mountain ranges to continue east. As the clouds rise up they cool and the moisture condenses to fall as rain or snow on the western side of the ranges. By the time the clouds reach the mountain’s east side they no longer have as much available moisture, creating a dry “rainshadow”. Four major mountain ranges lie between Death Valley and the ocean, each one adding to an increasingly drier rainshadow effect. The depth and shape of Death Valley influence its summer temperatures. The valley is a long, narrow basin 282 feet (86 m) below sea level, yet is walled by high, steep mountain ranges. The clear, dry air and sparse plant cover allow sunlight to heat the desert surface. Heat radiates back from the rocks and soil, then becomes trapped in the valley’s depths. Heated air rises, yet is trapped by the high valley walls, is cooled and recycled back down to the valley floor. These pockets of descending air are only slightly cooler than the surrounding hot air. As they descend, they are compressed and heated even more by the low elevation air pressure. These moving masses of super heated air blow through the valley creating extreme high temperatures. Why is it called Death Valley? Why is it a national park ? It is the lowest place in the North American Continent. 282 feet (86 m) below sea level. It is a significant area on the planet to do geological study. Its unique naturally, geologically, biologically to California’s already diverse geography, biology, and geology. I hope that I have convinced you to put this land on your travel wish list. Cheers ! OOTD : Navy cashmere Sweater – Everlane. Leggings – J. Brand. Boots – Churchs. A few scientists in the Silicon Valley believe that in our lifetime, we, the common folk can visit a neighboring planet or a satellite. While I talk about sustainability on Earth, they talk of colonizing/inhabiting other planets as the future of mankind. Space travel should be something I can put on my bucket list and realistically save money for, they tell me. “Earth is so beautiful, why should I bother”, I ask. “Don’t be that person who refuses to travel outside your country out of some tribal sense of pride. To be curious, to experience, to explore, to invent, to collaborate and to create, is our learning pathway”, I get told. I got a taste of what its like to live in a NASA photograph while camping out at Joshua Tree National Park. The millions of stars visible to the naked eye, the big rocks, the topography, the cold nights, the vast emptiness …. A night at the Indian Cove Campground felt like a visit to the outer space. Nothing could have prepared me for it. No photograph nor my words can capture what can be experienced. I could really see the milky way !!! We lit a fire under the rocks and ate supper staring at the sky. We tried to stay awake and stare at the moon window of our tent for as long as possible. If you fall asleep, its gone and you got to wait another day to experience it again. The daytime is a different reality – dust, sand, wind, cactus, rocks & the sun. Please go if you can ! Left : You get your own little cave under the rocks. A camp fire never felt this primitive and raw. Right : The stars visible from the moon window on top of our tent. Lay in silence and stare till you fall asleep. Simplify – Year 1, reflections. I am thankful that I am not a refugee with no home & no future prospects. I am living a normal happy life. I am an immigrant. The news hints at how quickly the status quo can change given the times we live in. I am very thankful for the circumstances, ideologies and the nations that make it safe for me. “What do you have enough of?” My answer would be really really long. I bought and bought over the years … and ran out of things I need. The FOMO is subsiding and I am okay with not collecting backups. I like what I own very much and there is only so much I can use+appreciate. I am okay with admiring beautiful garments I see in stores/runway and walk away with one thought – “isn’t it stunning?”. I need not attach the lines “I need it” to every item I find attractive. The way she looks at him is everything. I can almost touch her happiness through the frames. 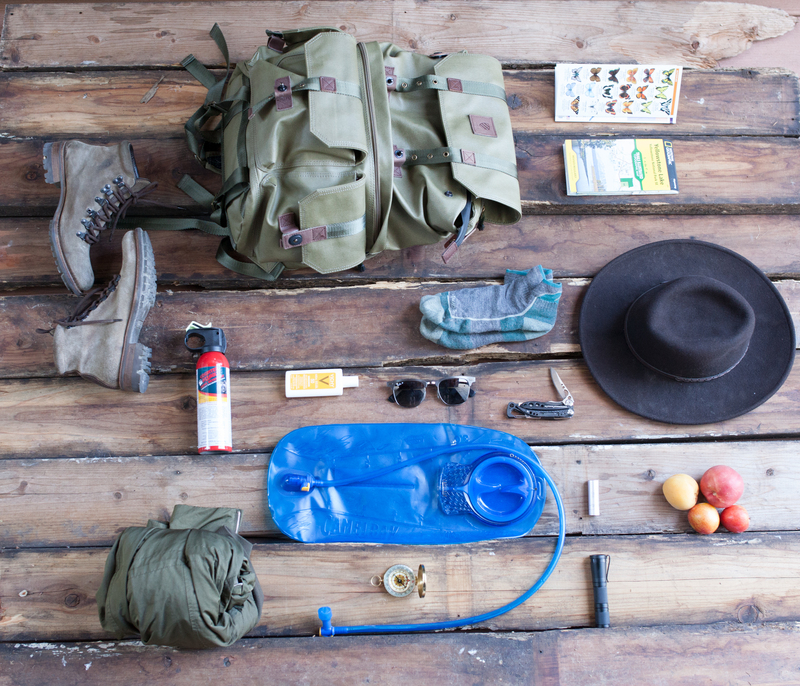 Every packing list and shopping list should take zero waste into consideration. I look up to folks who have achieved this lifestyle with awe and admiration. They seem to be able to make sacrifices and sign up for inconveniences for no immediate return. They spend more money to be earth-friendly. Money that can be used for brunch / clothes / travel / vacation / buying a house / retirement or what ever else is our priority. They deserve the recognition and applause. Take a bow for doing what I can’t seem to achieve. It is an intimidating concept. ( A 0 or 1. Trash in a mason jar. It has a branding problem ! ) The binary connotation to it that always makes me fixate on my failures instead of what I have done right. Low waste is my goal and very achievable given my location, circumstances and resolve. Ariana talks about finding a way to make zero waste work for you – great advice and thank you for all the encouragement. Camping means different things to Harsha and me. It’s his escape from the city life for a day or two… a getaway. I go because I want to live in the woods. I go for the pleasure. Campgrounds are million star hotels in disguise. The beauty of living close to nature with as little as possible has a purity that I lose constantly find myself losing in my everyday life. Perhaps I am looking for an escape too, from my own bad habits. Our backpacks are always packed and ready to go at moments notice. I see the nature that we currently have access to, attached to a ticking time bomb. The castles in Italy and the vineyards in France will stand. Not sure about the health of our forests. I am determined to explore California’s backcountry until our list is exhausted. I want to be that aunt who introduces the kids to the pleasures of sleeping under the trees and eating pancakes at sunrise. I want to be the grandma telling her grand-children about the great trees she walked under. I will tell them about the makeshift jingles that Harsha and I used to sing, to alert the bears of our presence on our trails. I will tell them about how we became children of the forest – climbing trees, jumping into swimming holes, counting banana slugs, cooking with fire, snuggling in feather beds, breathing the pure air, … Camping without trashing is a matter of planning and doing the required prep work. 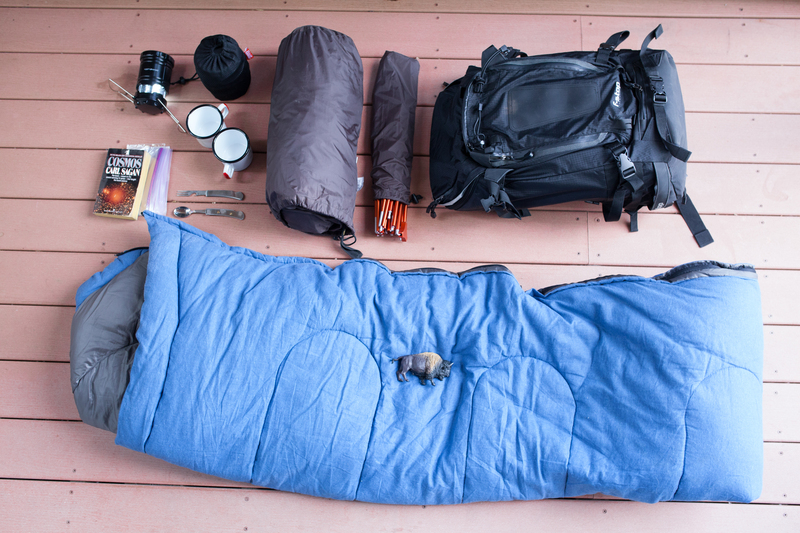 This is our master packing list. The longest we have done is 12 days. The longest backcountry trail we did was 15 miles in day while carrying our gear and carried it out it out the next day. We do weekend trips and day trips which require a subset of items from this list. It’s optimized for weight, budget and self-sufficiency. I promised a friend I will give him my Yellowstone packing list. So making a blog post out of it. I searched for this information and didnt find what I was looking for. The pro backpackers can get by with way less. They are the ones with the books and packing advice on the internet. This is what I needed to get by for 10 days. We didn’t know what to expect and what we really needed. We didn’t have the experience to pull off a long trip while cooking on the go. We didn’t know how to cook when it rained hard. Boxes of cookies and other junk food was consumed. We took ALL the cold weather gear we had. And ended up needing only half of it. I want to go to the Grand Canyon and Yosemite National Parks in the next one year. I hope this list serves us better for the next trip. We packed a backpack that we could leave at the camp ground on most days with food and clothing. When we moved campgrounds, it was easy to displace all the ‘stuff’ with us. 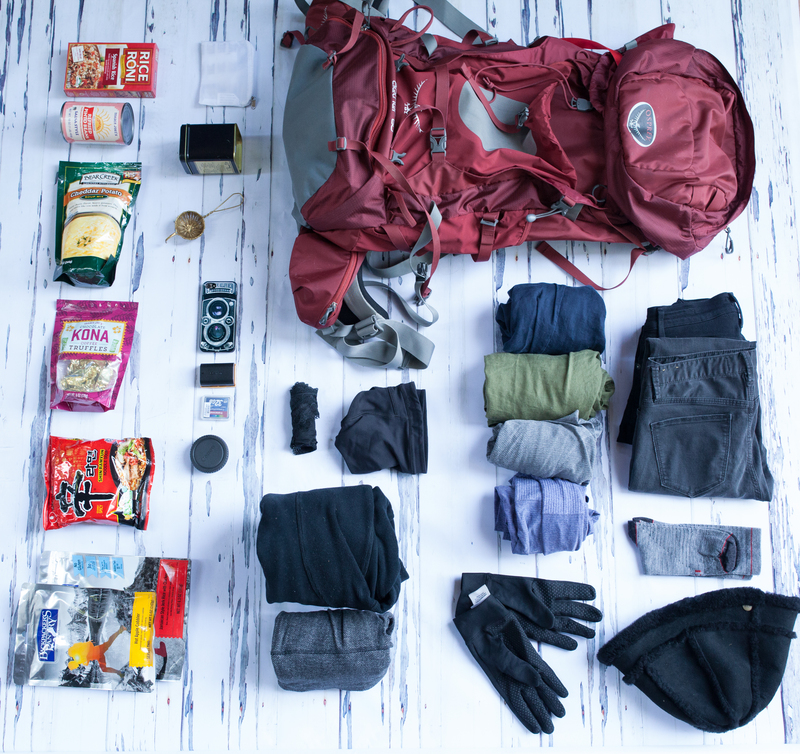 Clothing : sweat wicking shirts ( 5 ), good insulation jacket (1), pants ( 2 ), sleep tent clothes : yoga pants ( 1 )+ hoodie ( 1) , Sports bras ( 5 ), underwear ( 7 ), Camp socks (3), Gloves and a beanie. I love how good lululemon clothes are, for this purpose. They are light, dry fast and have excellent sweat wicking properties. I didnt need special camping/workout clothing. Most of my everyday clothes did great. I wore Madewell and Citizens of Humanity stretchy jeans for hiking. And J Crew linen shirts for tops. Socks were the only indulgences before the trip. Food : I need to work on this area for the future. I ate so much junk food that its disgusting. Dehydrated “healthy’ food from Backpackers Pantry. Shin bowls from Asian stores. Anything that said pour water and heat from Trader Joes : polenta, beans, potato soup mix, spanish rice, chilli, etc. We also ate large amount of chocolate and cookies when tired. Longer the stay, harder it gets to eat fresh. Our third bag consisted of camp essentials – Tent , sleeping bag, camp light, camp stove, fire starter, a book and a few utensils. A day bag is essential for going away all day from the campground and for sustenance on hikes. It is tempting to pack for every emergency but it comes at the cost of fatigue per kilo per hour. Bear spray, hydration pack, rain jacket, snack, wallet, phone, memory card, battery, sunscreen, Camera, compass, maps, gloves, shades, torch light and a good multi purpose knife. Backpacking is a lifestyle. It’s not something you do on a trip and go back to your usual self. I have noticed my favourite backpackers forego the 20$ meals and expensive shampoos all year long to be able to afford full time travel. They wear the free t shirts, live off of PBJ’s if they have to while living in 8 by 5 feet spaces, forego pursuit of the non essential to do what they want to do. It is not a choice of suitcase/luggage while travelling. Its the thought of having one more thing than the essential == will break the back and make it harder to travel. And in turn, travel changes you to fit into this lifestyle. It took me a long time to learn this. I am in perpetual conflict between my nomadic tendencies and pleasures of having a well stocked nest. I don’t see it ending any time soon.